The Michigan Economic Development Corp., which oversees the Michigan Film Office, commissioned Michigan State University's Center for Economic Analysis to provide a study of the economic impact of the spending done by films receiving refundable tax credits under the Michigan Film Incentive program. The resulting report, written by Steven R. Miller and Abdul Abdulkadri, was published on Feb. 6, 2009. The MSU report has two strengths. To the authors' credit, they take care to exclude from their calculations film spending that probably had no impact on Michigan's economy because it likely occurred outside the state. This decision is noteworthy, not simply because it is the right thing to do, but also because the Michigan Film Office does not appear to have shown similar care in its own report on the MFI program. Hence, the MSU study's authors conclude that $65.4 million was spent in Michigan by the 32 films for which they had data, while the Film Office states that total Michigan expenditures were $125 million for the 35 films for which it had data (the Film Office, writing later, had information for several additional films). The MSU figure appears to be the better estimate, although it is difficult to say with perfect certainty, since the original data has not been made publicly available. Nevertheless, to argue (as the MEDC did to the Mackinac Center's Kathy Hoekstra) that the difference between the two figures is due to the MSU researchers' using earlier, unaudited figures is implausible. Those early figures would have had to be inexcusably inaccurate to produce an estimate that was off by nearly 50 percent. Nor is it likely that the three extra films the Film Office included could account for such a startling difference. The MSU authors' care in this regard has thus helped raise important questions about the Film Office numbers — questions that would have been difficult to ask otherwise, given the lack of public access to the original data. The second strength of the MSU report lies in a similar area. The Film Office report states that the films' spending produced 2,800 Michigan jobs. The MSU report mentions direct gains of 2,763 jobs, but adds that these involved short-term employment of just 23 days on average, producing a "full-time equivalent" of just 254 jobs. Again, the MSU report disclosed important information that appears to have been omitted in the Film Office report. Unfortunately, the MSU report is otherwise a flawed product. The authors take great pains to explain the workings of the model they employ — known as REMI[*] Policy Insight — and the impact that film industry expenditures have on Michigan's economy through the "multiplier effect." This multiplier effect involves subsequent rounds of spending. For example, a film company may contract with a hotelier, caterer and set designer. Those individuals then spend the money hiring new employees or buying more ingredients to make their products and so on. The authors report that due to such multiplier effects, more jobs were created than just the 254 full-time equivalents that were the direct result of the filmmakers' hiring. Rather, the authors conclude, "[F]ilm productions generated 1,102 year-round equivalent jobs in 2008," and, "Based on generally accepted economic theory, multiplier impacts will increase over time." They report that with the multiplier effect, annual state economic output will increase by $335.6 million by 2012. News agencies around the state dutifully reported this apparent good news — which is probably what the Michigan Film Office had in mind. But these numbers are grossly overstated because the paper's authors deliberately excluded the costs associated with the program. In other words, significant taxpayer costs were not entered into the model. Had they been, the output would have been different — perhaps dramatically so — showing far fewer jobs created, for instance, or even a net job loss. 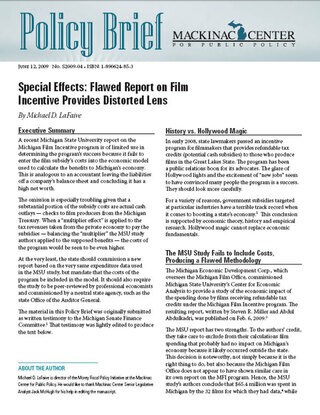 Thus, when MSU's Center for Economic Analysis boasted in a press release that the film incentive law was a "big hit," they did so knowing the model used in their study had been programmed with only the benefits of film expenditures, not the costs. Ignoring these costs in the model is roughly equivalent to a certified public accountant omitting a balance sheet's liabilities and then touting the success of the company. The costs of the Michigan Film Incentive are significant. In 2008, the program is said to have produced $48 million in refundable tax credits; estimates for future years indicate that costs could exceed $200 million. Due to the extraordinarily generous film credits being "refundable," a substantial portion of these costs represents actual cash outlays — State of Michigan checks written to producers — rather than the "forgone revenues" of most targeted tax breaks. Moreover, these subsidy outlays represent revenue taken from Michigan employers and families. If that money had been left in their hands, it would also have generated a multiplier effect. In other words, if the proponents of film subsidies attribute a multiplier effect on the benefit side, they must also acknowledge the same effect on the cost side. [*] REMI is an acronym for Regional Economic Models Inc.